The Loughcrew Cairns, also known as the ‘Hills of the Witch’, are a group of Neolithic passage tombs dating back 5,000 years. 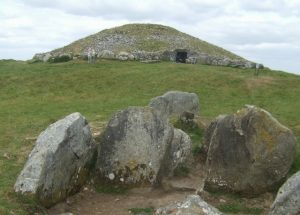 The tombs are spread out over three different hills and inside Cairn T, one of the largest tombs, visitors can see a cruciform chamber, corbelled roof and stunning examples of Neolithic art. 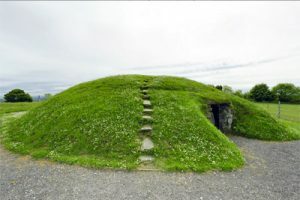 During the spring and autumn equinoxes, people traditionally gather at dawn to watch sunlight enter the Cairn T chamber and illuminate the interior of the tomb. Four Knocks is a Passage Chamber Tomb built about 5000 years ago. It is located 10 miles southeast of Newgrange between Ardcath in County Meath and the Naul in County Dublin. The name Fourknocks may be from the Irish Fuair Cnocs meaning Cold Hills. The key for the entrance door to Fourknocks Passage Tomb can be got from Mr. Fintan White who lives over a mile from the Tomb. Directions are signposted from Fourknocks. A cash deposit must be given which is refundable on the safe return of the key. The key should be returned before 6pm.